Updates at 3:45pm are highlighted. The Arctic front has moved through the entire metro - and wasn't it a doozy? Temperatures were near 60° at 11:30am and now are in the lower to mid 40s (as of 2pm) with northwest wind routinely gusting to 30-35 mph. Memphis International recorded a 49 mph wind gust as the front passed. Behind the front, spotty light rain is occurring this afternoon as temperatures fall. The final "kicker," an upper level disturbance, will graze the area to our north later today, bringing with it one more defined round of precipitation. Temperatures near the surface and aloft will continue cooling, allowing that precipitation to fall as light snow this evening. How much: a trace (over north MS) to 1/2" (Tipton County). That leaves most of us with a dusting to 1/4" on cold exposed surfaces, mulch beds, etc. 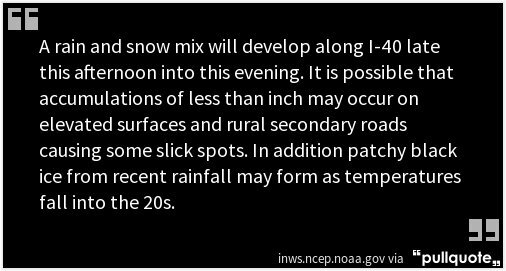 A bit of sleet is also possible as rain transitions to snow. The NWS forecast from late Saturday morning of projected snowfall totals. 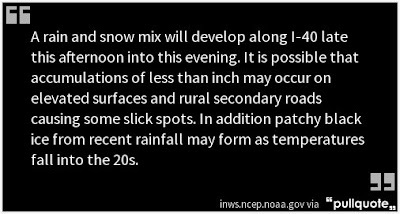 Minor accumulation is possible roughly north of I-40. 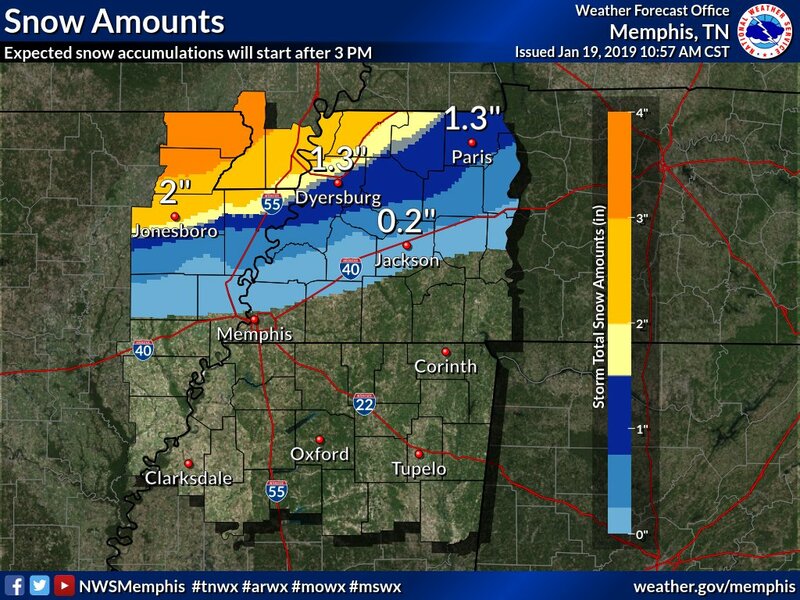 [Updated] When: Light snow or sleet could begin mixing with the rain by 3-4pm in Tipton County and 4-5pm in north MS, becoming all snow by 5-6pm, and ending by 7-9pm. It won't last long. Confidence: High. Light snow is expected for most of the metro, timing is fairly well locked in, and amounts are agreed on by the vast majority of our model data, including most of the members of the model ensembles, which just means the models are run over and over and the results are all pretty well in line. Meteorologists use this ensemble data to gauge confidence in the forecast and see what the potential is from the "outliers." In this case, well over 80% of all of the available data likes the forecast above. 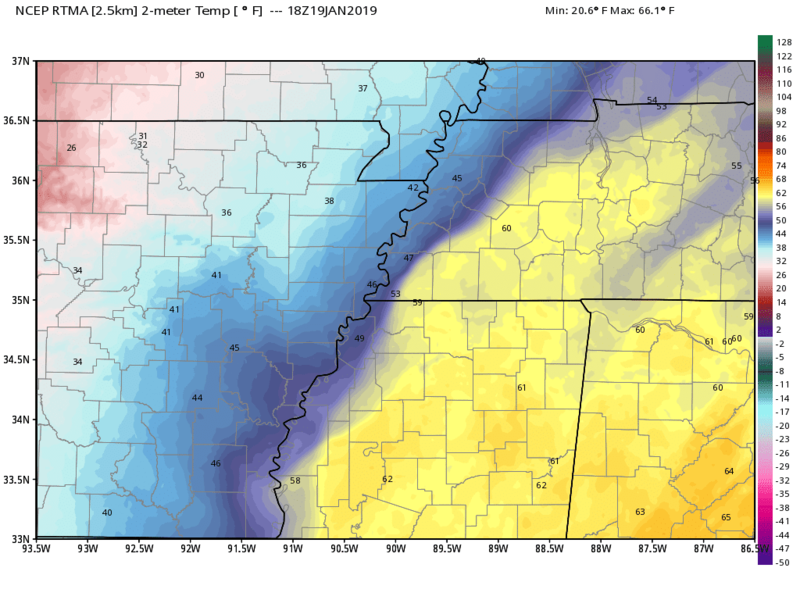 On Sunday morning, temperatures will be in the mid 20s with wind chills well down into the teens - a major departure from 24 hours previous when temperatures were about 55°! The wind will help dry streets overnight, but again, be cautious on the elevated overpasses and roads as the rain from today could freeze in spots overnight. That results in black ice. Will this be our only chance this winter? In short - no. See our recent blog that described how cold air will dominate the weather pattern for perhaps as much as the next 4-6 weeks. There are a couple more systems just in the next week or so that will need to be monitored. No major storms on the horizon, but in this pattern, you just never know! 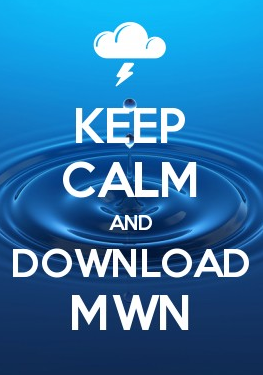 Keep an eye on the MWN Forecast (linked below or in the app) for the latest.